Safe Dig has been in operation since 1994 and has over 25 years of experience in Vacuum Excavation, Underground Service Locating, Plant Hire and Civil Construction. With depots located in Brisbane, Gladstone and Mackay, Safe Dig provides expert non-destructive digging services to a range of Queensland locations. Here at Safe Dig we have extensive knowledge and experience in vacuum excavation, service location, civil services and pipe clearing and jetting. We are experts in identifying and safely excavating around underground services, clearing or levelling out an area, pit dewatering, or using high-pressure water to clear drain blockages and debris from pipes. By providing high quality customer service, we are proud to have based our success on strong client relationships and quality team management alongside our expert knowledge and professional team in vacuum excavation for hire. Dedicated to delivering high quality work and providing a safe work environment, we have ensured a team that is prompt and reliable supported by a fleet of machinery that is safe and meticulously maintained. Our Safe Dig team utilises state of the art technology and equipment with all operators trained and certified in the industry and experienced in cable location and vacuum excavation services. 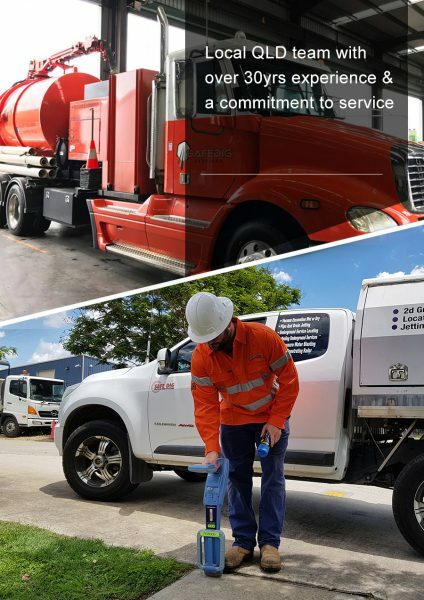 Our team of certified staff manage and maintain our fleet of trucks for operation and hire ensuring everything is meticulously maintained and have the relevant competencies including national accreditation provided by Telstra, Optus, Energex, Ergon Energy, BMA and Thiess. We are currently one of the few accredited Telstra Locating contractors for Optic Fibre in Brisbane, Gladstone and Mackay. We service major companies and clients, some of which include All-Roads, Aurizon, Queensland Rail, Lendlease, BMD Constructions, QBC, Shamrock, Shadforth Civil, GHD Engineering, as well as both major urban and regional councils. Safe Dig takes pride and care in every job and ensures each and every Underground Service Location, non-destructive digging, Excavation and Jet rodding job is done efficiently and safely. Michael and his team at Safe Dig Services are always a pleasure to work with. A company who pride themselves on their knowledge, experience and high standard of equipment in the vacuum excavation industry.